Fleetwood Masonic Hall was bursting at the seams with 97 companions who were there to celebrate the centenary of Hesketh Chapter No 950. So much so that bookings had to be closed and the festive board held at the North Euston Hotel, a fitting venue as Hesketh Chapter was consecrated in that hotel. Pictured from left to right, are: Chris Band, Tony Harrison, David Wright, Mark Tomlinson, Paul Smedley and Ian Higham. The companions were in awe at the sight of the full Provincial team headed by Grand Superintendent Tony Harrison. He was accompanied by Chris Band acting as Second Provincial Grand Principal, Ian Higham Third Provincial Grand Principal, Duncan Smith, Chris Butterfield, Andrew Ridal, David Case, Godfrey Hirst, David Thomas, Andrew Barton, Neil MacSymons, Anthony Cassells, David Tattersall and Peter Maxwell. The team was supported by fellow grand officers including North Fylde Group Chairman Peter Greathead, Terry Hudson, Harry Cox, Malcolm Worsley, Harry Saunders, Stuart Thornber and David Randerson. The three principals, lead by Mark Tomlinson, opened the centenary convocation and quickly completed the early business of the chapter. When Mark announced that the next business was to celebrate Hesketh Chapter’s centenary, the expected knocks on the door saw admitted the Deputy Grand Director of Ceremonies David Thomas, David’s entrance heralded the presence of Tony Harrison who demanded admittance. Tony was preceded by a colourful procession of grand and acting Provincial grand officers. Once Tony was welcomed by the principals, Mark Tomlinson offered him the sceptre of the chapter and, as is his right, Tony retained it and occupied the first principal’s chair. Tony then invited Chris Band and Ian Higham to occupy the second and third principal’s chairs respectively and the other Provincial officers to assume their roles in the chapter. Members of the Provincial team on the top table. Tony asked the companions to assist him and open Provincial Grand Chapter. Tony opened proceedings by expressing what an auspicious occasion the centenary was and how delighted he and the Provincial team was to be there to celebrate it. Tony then called on Andrew Ridal to read out the centenary warrant to the assembled companions. Once complete, Tony presented the warrant to Mark Tomlinson and pinned a centenary jewel on his breast, which in turn allowed the companions to wear their jewels. Tony then requested the next order of business for Rev Canon Godfrey Hirst, Clerk in Holy Orders, to deliver an oration and to give a prayer of rededication to the assembled companions. Godfrey began his oration by relating his own memories of Fleetwood starting 70 years ago when people came to the town by train on their holidays; taking the steamer to Knott End, playing the slot machines on the now-gone pier, watching puppet shows on the grounds of the Marine Hall and listening to the Salvation Army band playing on the sands. Godfrey moved on to the history of Freemasonry in Fleetwood starting 175 years ago when Fylde Union Lodge No 533 relocated from Garstang and had its first meeting at the Fleetwood Arms Hotel on 18 October 1844. The lodge from that date onwards had a chequered history and their warrant was withdrawn by United Grand Lodge in 1853. However, those nine years must have stimulated sufficient interest in Freemasonry for a new lodge to be founded, and on 2 April 1863 Hesketh Lodge 950 was consecrated. 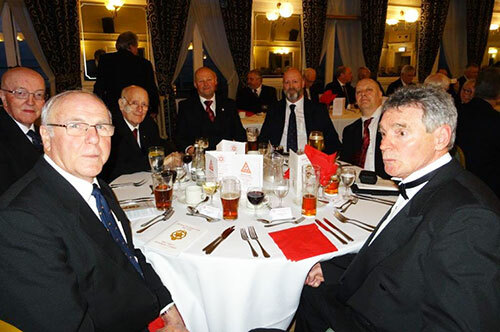 75 years after Hesketh Lodge’s consecration Royal Arch Masonry came to the town and Hesketh Chapter No 950 had its consecration at the North Euston Hotel on Wednesday 26 March 1919. Godfrey noted the many distinguished companions that had graced its membership. Godfrey continued to give explanations on many of the aspects of Royal Arch Masonry. Finally, Godfrey gave a prayer to rededicate the chapter for the next 100 years. Tony then called on Walter Porter to give a short history of the chapter which started with the Charter of Constitution granted to the founders of Hesketh Chapter by Supreme Grand Chapter on 6 September 1918 and the consecration was held at the North Euston Hotel on Wednesday 26 March 1919. Three of the founders Walter said, that deserve a mention are Magnus Bodver Johannessen Wedum who was initiated into Hesketh Lodge in 1906 and who was WM in 1917. Sidney Frank Shipway was initiated into Hesketh Lodge in 1909 and Tom Oldham was a founder of Fleetwood Lodge No 3711 in 1914 and also was station master at Fleetwood railway station. Pictured from left to right, are: Eric Peat, Alan Fairhurst, Tony Hough, John Cross, Tony Farrar, Peter Dunn and Sandy Walls. Walter moved to the period that covered the Second World War starting in 1939, it proved to be a traumatic year not only for the world in general but also for Freemasonry as in October of that year, a month after the start of the Second World War, United Grand Lodge decreed that, having regard to the Emergency Orders of HM Government, until further notice, all Masonic meetings were to be suspended. Fortunately, this was rescinded after one month and the chapter’s November installation took place as usual. During the War, the Grand Master had requested that refreshments be kept as simple as possible to conform to the need for national economy. In 1940, the period between 27 May to 4 June saw the evacuation of the British Expeditionary Force from Dunkirk. It is a little-known fact that six Fleetwood trawlers were diverted from Fleetwood to assist in the evacuation; none were lost to enemy action. In total, 34 Fleetwood trawlers were requisitioned by the Admiralty of which 17 were lost to enemy action. One of the first in November 1939 was when C H Gibson, a trawler skipper, and a member of Hesketh Chapter, was killed in enemy action. In the late 1960’s there were six Craft lodges in Fleetwood. Hesketh No 950, Fleetwood No 3711, Onward No 5540, Mount No 6654, Pharos No 7421 and Wyre No 7704, but only one Royal Arch chapter, Hesketh Chapter No 950. 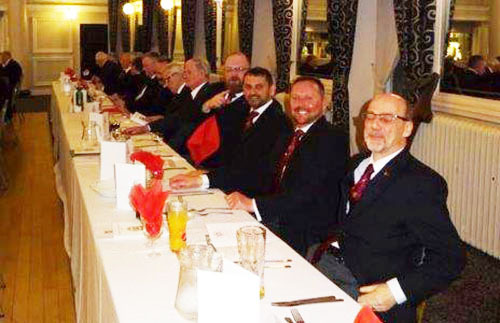 It was felt that the formation of another Royal Arch chapter in the town would not be to the detriment of Hesketh Chapter and indeed, that has proved to be so and the strong links between the two chapters continue to this day. In 1970, Fleetwood Chapter No 3711 was consecrated. To the present day, Hesketh Chapter continues to grow from strength to strength with many members joining and waiting in the wings for their time to step into the principal’s chair. At the conclusion, Tony requested that all the companions joined him in singing the National Anthem. Once done, Tony closed the Provincial Grand Chapter and returned the sceptre to the hands of Mark Tomlinson. Mark presented Tony with a cheque for £800 towards the 2021 MCF Festival and in return was presented with a Vice Patron’s certificate. On the third and fourth risings one very welcome guest Simon Moore, the great grandson of one of the founders, Tom Oldham, brought the greetings of the visitors which completed the circle of the first 100 years of the chapter. The companions then retired to the grand setting of the North Euston Hotel ballroom for the sumptuous festive board, a fitting venue as it was the setting 100 years ago for the consecration ceremony. 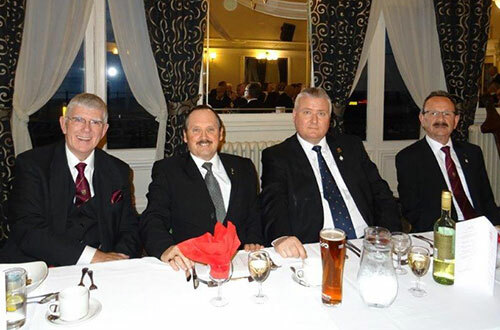 Pictured from left to right, are: Tony Harrison, David Wright, Mark Tomlinson and Paul Smedley. In response to the toast to his health, Tony Harrison thanked the Provincial team for the support that they had given him during the evening, and he said that the ceremony had been something very special and thanked Rev Canon Godfrey Hirst for his oration. Tony continued to encourage the brethren to offer the opportunity to those gentlemen who are on the outside looking in to join our fantastic fraternity. Tony said that being part of the Craft and Royal Arch, had given him a sense of belonging; belonging to an organisation that’s caring in so many ways, caring for our members, caring for our dependants and caring for our community. Tony moved to the topic of ‘Solomon’, the on-line resource that is there to educate and stimulate. It is there for people who want to learn more and brings together material from many sources into one package. It comprises easily manageable nuggets that can be presented in meetings to stimulate a desire to learn more. Tony thanked the chapter for their generous donation to the 2021 Masonic Charitable Foundation Festival and urged those members who haven’t taken out a pledge to consider doing so in the future. He asked the companions to support the ‘Night with the Stars’ at the Winter Gardens. In concluding Tony thanked Hesketh Chapter’s organising committee and in particular praised David Platt for his hard work and excellent communication in putting this event together. A raffle held during the festivities raised a marvellous £380 and to conclude the evening in a fitting manner the Provincial Grand Janitor proposed the janitor’s toast. Pictured from left to right, are: Neil MacSymons, Andrew Ridal, Duncan Smith, Chris Band, Tony Harrison, David Wright, Mark Tomlinson, Paul Smedley, Ian Higham, Peter Greathead, David Case and David Thomas.